APPMA Annual Scholarship for a Diploma in Packaging Technology. The Australian Packaging and Processing Machinery Association (APPMA), in conjunction with the Australian Institute of Packaging (AIP), are pleased to announce that submissions are open for the tenth annual Scholarship program which will enable one lucky packaging technologist, designer or engineer in Australia the opportunity to complete a Diploma in Packaging Technology to the value of $9,000. WHO AM I? Diploma in Packaging Technology students are from a variety of backgrounds and disciplines, and are typically experienced practitioners or managers in technical, sales/marketing, QA, purchasing, engineering or design. WHAT’S IN IT FOR ME? Completion of the Diploma in Packaging Technology demonstrates your commitment to your career and to the industry. Delegates who successfully complete the Diploma are equipping themselves for senior positions within the packaging industry. 2019 APPMA Scholarship now open! The winner of the 2018 APPMA Scholarship was announced in front of 500 people during a gala awards dinner for the global packaging community at the Marriott Hotel Surfers Paradise, Queensland. The gala dinner was a joint event between the 2018 PIDA Awards and the international WorldStar Packaging Awards with 30 countries in attendance on the evening. 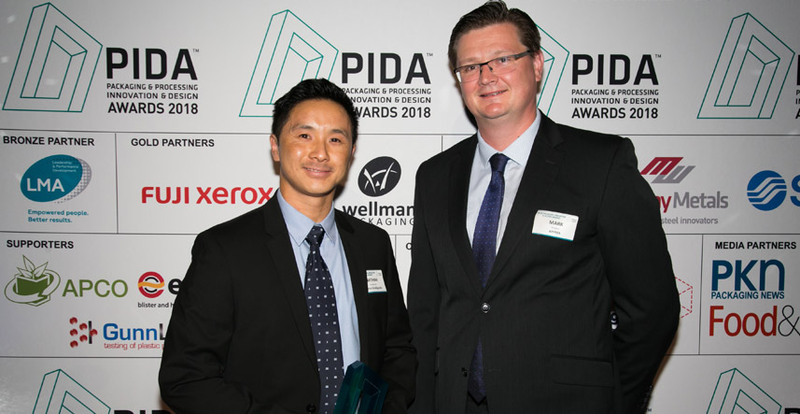 The 2018 APPMA Scholarship winner is Nathan Leong MAIP, Packaging/Product Technologist, Primo Smallgoods. Holding a Bachelor of Applied Science Degree (Major in Food Science & Nutrition), Nathan Leong currently works in the food industry in Product and Research Development Roles. He understands that after twelve years in the food industry packaging design/development plays a pivotal role in the success of product protection, shelf life and marketing. Having this packaging knowledge in future will provide a diverse technical knowledge to add value in his current business in both areas of product and packaging. Nathan has always been curious about various types of corrugates used for sporting cards and its primary and secondary encased packaging formats. He has been fascinated by the progression in food packaging from tetra packs, reclosable films and creation of packaging through 3D printing. Nathan hopes that someday he might be fortunate enough to be a part of packaging design that may benefit the world in some way. The APPMA, in conjunction with the Australian Institute of Packaging (AIP), have been running the annual scholarship program for ten years providing a packaging technologist, designer or engineer in Australia, the opportunity to complete a Diploma in Packaging Technology to the value of over $9000. The APPMA have generously sponsored this educational scholarship for over a decade and are the largest supported of furthering education in the wider industry. Please join with the APPMA and the AIP in congratulating Nathan Leong on his scholarship. The APPMA, in conjunction with the AIP, offered their ninth annual scholarship program which enables one person the opportunity to complete a Diploma in Packaging Technology valued at $9,000. The Diploma in Packaging Technology prepares students to take responsibility for packaging operations at any level through the supply chain. The qualification is internationally recognised, comprehensive, and provides an opportunity to study the principles of packaging, packaging materials and packaging processes. Finalists were: Nelson Bulsari, Technical Director, Roto Converters NZ, Liz Cagorski, Brand Custodian Packaging Specialist, Liza Rose design and communications, John Ferrier, Quality Manager, Campari, Claire Lee, Packaging Quality Coordinator, LION and Michael Van Dord, Technical and Design Engineer, Caps and Closures. The judges reviewed all written applications and were impressed with the packaging technologists who wished to advance their knowledge through the AIP Diploma in Packaging Technology course. The challenge is always selection amongst such great talent. Michael Van Dord, Technical and Design Engineer, Caps and Closures. Michael Van Dord also has a design background since moving over from Aerospace engineering and has moved into project engineering across many applications of caps and closures with numerous FMCG companies. He also has a passion for education and has already conducted lectures on packaging related matters. The APPMA are very proud to announce the winner of the eighth annual scholarship program which enables one person each year the opportunity to undertake a Diploma in Packaging Technology to the value of $9000. The Diploma in Packaging Technology prepares students to take responsibility for packaging operations at any level through the supply chain. The qualification is internationally recognised, comprehensive, and provides an opportunity to study the principles of packaging, packaging materials and packaging processes. The judges would like to recognise each of the five finalists as they are fine examples of the future leaders of this industry. The winner for the 2016 APPMA Scholarship winner is Michael Seaman, Packaging & Process Improvement Specialist, Integria Healthcare. Michael was an outstanding candidate who is extremely passionate about packaging. He has a broad understanding of the applications and implications of packaging and the judges believe his passion will greatly assist his studies. Michael will commence his Diploma in Packaging Technology this year and both the APPMA and the AIP look forward to seeing him graduate in a few years. 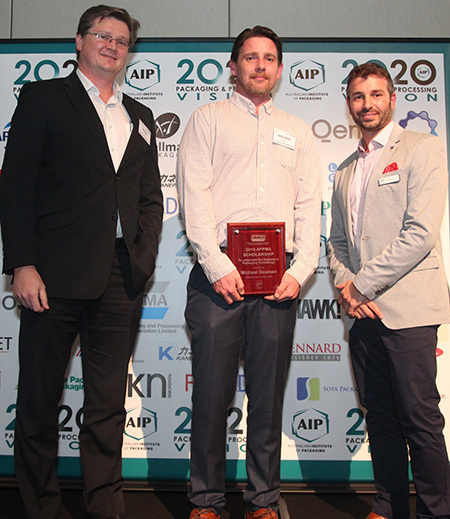 In front of over 380 people during the 2015 APPMA Industry Excellence Awards at the Crown Towers the APPMA announced the winner of the seventh annual scholarship program which enables one person each year to study a Diploma in Packaging Technology. “Alysha Baggett displayed a sound understanding of what is involved and showed great interest beyond the basics of packaging technology. She has the right credentials, knows what she wants to achieve and appears to have the drive to make it all happen. Alysha has the basic academic qualifications in place to build upon and her current workplace and general interests certainly gave her the edge over other applicants. The judges believe that she has sound inherent qualities of mind and character, has a solid foundation with a good positive outlook, the will to achieve and an excellent track record in her short working career. Alysha wants to be the best in her portfolio. She is a worthy recipient and we wish her well,” Mr Dingley said. “Alexandra Brayshaw has displayed great tenacity over a number of years, driven by her passion and enjoyment of her work and involvement in a very interesting sector of packaging. The judges believe that she will do well in this particular field by making those contributions that they seek in their scholarship winners. It was a very tough and gruelling interviewing process this year with very little % points separating the top 4 applications, but we felt that Alexandra had the edge on the others, and something that we in packaging look forward to experiencing more from her, in the years to come.” he said. The two other finalists were Marianna McEwan, Contract Packaging Technologist, Frucor Beverages and Mona Parnian, Quality Systems Engineer, Wellman Packaging. 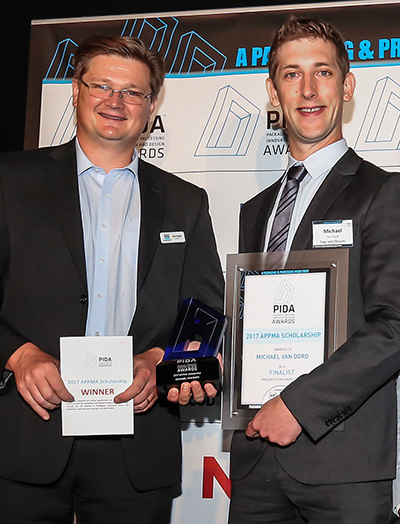 During the 2014 AIP National Conference at the Sofitel Wentworth in Sydney the APPMA announced the winner of the sixth annual scholarship program which enables one person each year to study a Diploma in Packaging Technology. Mark Dingley, Chairman of the APPMA announced that the 2014 APPMA scholarship winner is Aleah Back, Packaging Engineer, Johnson and Johnson Pacific. “Aleah not only has an interest in packaging but also the engineering process and she has had the opportunity to learn about injection technology, in-mould labelling and advanced robotic production systems. Aleah will commence her Diploma in Packaging Technology this year and we look forward to seeing her graduate.” Mr Dingley said. The APPMA would also like to congratulate all the finalists as they were of exceptional calibre this year. The three other finalists were Alexandra Brayshaw, Research Assistant, Arthritis Australia, Mirvic Camacho, Packaging Engineer, Murray Goulburn and Sumit Kini, Continuous Improvement Specialist, Orora Glass.